2012-02-14 Assigned to ACUSHNET COMPANY reassignment ACUSHNET COMPANY ASSIGNMENT OF ASSIGNORS INTEREST (SEE DOCUMENT FOR DETAILS). Assignors: COMEAU, BRIAN, SULLIVAN, MICHAEL J. This application is a continuation-in-part of U.S. patent application Ser. No. 13/220,925, filed Aug. 30, 2011, which is a continuation-in-part of U.S. patent application Ser. No. 13/041,286, filed Mar. 4, 2011, which is a continuation of U.S. patent application Ser. No. 12/891,324, filed Sep. 27, 2010 and now U.S. Pat. No. 8,007,376, which is a continuation-in-part of U.S. patent application Ser. No. 12/339,495, filed Dec. 19, 2008 and now U.S. Pat. No. 7,815,526, which is a continuation-in-part of U.S. patent application Ser. No. 12/196,522, filed Aug. 22, 2008 and now U.S. Pat. No. 7,582,025, which is a continuation of U.S. Pat. No. 7,427,242, filed Nov. 14, 2007, the disclosures of which are incorporated herein by reference thereto. This invention relates generally to golf balls with cores and, more particularly cores having a thermoplastic inner core layer and a thermoset outer core layer. Both the inner and outer core layers have a “positive hardness gradient,” the gradient of the outer core layer being ‘steep’ and the gradient of the inner core being ‘shallow’. As such, there is a need for a golf ball core, in particular a dual core, that has a gradient from the surface to the center (or inner portion) of each core layer. The hardness gradient may be either soft-to-hard (a “negative hardness gradient”), hard-to-soft (a “positive hardness gradient”), measuring radially inward, or, in the case of a dual core having a thermoplastic inner core layer, any combination of hardness gradients for each core layer (e.g. positive/positive, positive/negative, negative/positive, or negative/negative). A core exhibiting these various hardness gradients will allow the golf ball designer to create a thermoplastic core golf ball with unique gradient properties allowing for differences in ball characteristics such as compression, “feel,” and spin. The present invention is directed to a golf ball including an inner core layer consisting essentially of a thermoplastic material and having a geometric center hardness greater than a surface hardness to define a negative hardness gradient; an outer core layer disposed about the inner core, the outer core being formed from a substantially homogenous thermoset composition and having an inner surface hardness substantially less than an outer surface hardness to define a positive hardness gradient; an inner cover layer disposed outer core layer; and an outer cover layer disposed about the inner cover layer, wherein the negative hardness gradient is from −1 to −5 Shore C, the positive hardness gradient is 25 Shore C to 45 Shore C, and a difference between the inner core surface hardness and the outer core inner surface hardness, Δh, is at least 25 Shore C.
Preferably, the difference between the inner core surface hardness and the outer core inner surface hardness, Δh, is 25 Shore C to 45 Shore C, more preferably 30 Shore C to 35 Shore C. The inner core center hardness should be about 90 Shore C to about 100 Shore C. The inner core surface hardness should be about 85 Shore C to about 95 Shore C. The hardness of the inner surface of the outer core layer should be about 50 Shore C to about 60 Shore C. The hardness of the outer surface of the outer core layer should be about 82 Shore C to about 92 Shore C.
The present invention is also directed to a golf ball including an inner core layer consisting of a thermoplastic material and having a geometric center hardness greater than a surface hardness to define a negative hardness gradient between −1 Shore C and −5 Shore C; an outer core layer disposed about the inner core, the outer core being formed from a substantially homogenous thermoset composition comprising a diene rubber and having an inner surface hardness less than an outer surface hardness to define a substantially positive hardness gradient of at least 25 Shore C; a cover layer disposed outer core layer, the cover layer comprising an inner cover layer comprising an ionomer and an outer cover layer comprising a castable polyurethane or polyurea material, wherein a difference between the inner core surface hardness and the outer core inner surface hardness, Δh, is 25 Shore C to 45 Shore C.
The present invention is further directed to a golf ball including an inner core layer consisting of a thermoplastic material and having a geometric center hardness greater than a surface hardness to define a negative hardness gradient between −1 Shore C and −5 Shore C, the center hardness being about 90 Shore C to about 100 Shore C and the surface hardness being about 85 Shore C to about 95 Shore C; an outer core layer disposed about the inner core, the outer core being formed from a substantially homogenous thermoset composition comprising a diene rubber and having an inner surface hardness less than an outer surface hardness to define a positive hardness gradient of at least 25 Shore C, the inner surface being about 50 Shore C to about 60 Shore C and the surface being about 82 Shore C to about 92 Shore C; a cover layer disposed outer core layer, the cover layer comprising an inner cover layer comprising an ionomer and an outer cover layer comprising a castable polyurethane or polyurea material, wherein a difference between the inner core surface hardness and the outer core inner surface hardness, Δh, is 25 Shore C to 40 Shore C.
The present invention is directed to a golf ball including a highly neutralized thermoplastic inner core layer comprising a highly-neutralized ionomer including a copolymer of ethylene and an α,β-unsaturated carboxylic acid, an organic acid or salt thereof, and sufficient cation source to neutralize the acid groups of the copolymer by 80% or greater. The inner core has a geometric center hardness less than its surface hardness to define a first hardness gradient. An outer core layer is disposed over the inner core and is formed from a thermoset composition. The outer core layer has an interior hardness substantially less than the hardness at its outer surface hardness to define a second hardness gradient. An inner cover layer and an outer cover layer are disposed about the core. The first and second hardness gradients are positive and a slope of the second hardness gradient is greater than a slope of the first hardness gradient. The present invention is directed to a golf ball comprising including an inner core layer and an outer core layer. The inner core is formed from a thermoplastic highly-neutralized ionomer including a copolymer of ethylene and an α,β-unsaturated carboxylic acid, an organic acid or salt thereof, and sufficient cation source to neutralize the acid groups of the copolymer by 80% or greater. The thermoplastic inner core has a geometric center hardness that is less than its surface hardness to define a first positive hardness gradient. An outer core layer is formed around the inner core. The outer core includes a homogenous thermoset composition and has an interior hardness less than its outer surface hardness to define a second positive hardness gradient. The golf ball also includes an inner cover layer and an outer cover layer. In a preferred construction, the inner core layer has an outer diameter of about 0.5 inches to about 1.13 inches. The acid groups of the copolymer are typically neutralized by 90% or greater, most preferably by about 100%. The organic acid or its salt includes barium, lithium, sodium, zinc, bismuth, chromium, cobalt, copper, potassium, strontium, titanium, tungsten, magnesium, cesium, iron, nickel, silver, aluminum, tin, or calcium salts, or salts of fatty acids. The fatty acid salt comprises stearic acid, behenic acid, erucic acid, oleic acid, linoelic acid or dimerized derivatives thereof. Preferably, the organic acid or salt thereof includes a magnesium salt of oleic acid. In one embodiment, the outer core layer includes a soft and fast agent, preferably a halogenated thiophenol. FIG. 6 depicts representative hardness, in Shore C and D, and hardness gradient for a golf ball core including an inner core with a diameter of 1.0 inch and an outer core layer with a thickness of 0.275 inches and having a ‘shallow positive hardness gradient’. The golf balls of the present invention may include a single-layer (one-piece) golf ball, and multi-layer golf balls, such as one having a core and a cover surrounding the core, but are preferably formed from a core comprised of a solid center (otherwise known as an inner core layer) and an outer core layer, and a cover layer. Of course, any of the core and/or the cover layers may include more than one layer. In a preferred embodiment, the core is formed of a thermoplastic inner core layer and a thermosetting rubber outer core layer where the inner core has a “positive hardness gradient” as measured radially inward from the outer surface and the outer core layer also has a “hard-to-soft” hardness gradient (a “positive hardness gradient”) as measured radially inward from the outer core outer surface. The inventive cores may have a hardness gradient defined by hardness measurements made at the surface of the inner core (or outer core layer) and at points radially inward towards the center of the inner core, typically at 2-mm increments. As used herein, the terms “negative hardness gradient” and “positive hardness gradient” refer to the result of subtracting the hardness value at the innermost portion of the component being measured (e.g., the center of a solid core or an inner core in a dual core construction; the inner surface of a core layer; etc.) from the hardness value at the outer surface of the component being measured (e.g., the outer surface of a solid core; the outer surface of an inner core in a dual core; the outer surface of an outer core layer in a dual core, etc.). For example, if the outer surface of a solid core has a lower hardness value than the center (i.e., the surface is softer than the center), the hardness gradient will be deemed a “negative” gradient (a smaller number−a larger number=a negative number). The magnitude of the “positive hardness gradient” of the inner core layer is preferably “shallow” relative to the “steep” “positive hardness gradient” of the outer core layer or comparable to the ‘shallow’ “positive hardness gradient” in the most preferred construction, the terms “shallow” and “steep” being defined by the slopes of their comparative plots of hardness as a function of position away from the center of the core when the hardness is measured across the cross-section of a core. For example, magnitude of hardness change across either core layer may be similar or different, but in the case of similar hardness gradients, the gradient for the inner core may still be deemed “shallow” because the gradient is measured across a longer dimension than that of the outer core layer (i.e., a gradient of 10 Shore C across a 15-mm-radius inner core has a much more gradual slope than a 10 Shore C gradient across a 5-mm-thick outer core layer). For example, referring to FIGS. 5-6, the gradient across the outer core layer in FIG. 5 is 12 but the slope, m, is only about 0.96 whereas the hardness gradient across the outer core layer in FIG. 6 is lower, at 9, but the slope, m, is still about 0.96 (because it is across a shorter layer thickness). In a more preferred embodiment, the hardness gradient of the outer core layer is greater than or equal to the hardness gradient of the inner core layer, most preferably the hardness gradient of the outer core layer is greater than the hardness gradient of the inner core layer. In a most preferred construction, the hardness gradient of the outer core layer is ‘shallow’ (see FIGS. 5-6), having a slope of less than about 1.0 across the thickness of the layer. In one embodiment of the present invention the HNP's are ionomers and/or their acid precursors that are preferably neutralized, either fully- or partially-, with organic acid copolymers or the salts thereof. The acid copolymers are preferably α-olefin, such as ethylene, C3-8 α,β-ethylenically unsaturated carboxylic acid, such as acrylic and methacrylic acid, copolymers. They may optionally contain a softening monomer, such as alkyl acrylate and alkyl methacrylate, wherein the alkyl groups have from 1 to 8 carbon atoms. Ionomers are typically neutralized with a metal cation, such as Li, Na, Mg, K, Ca, or Zn. It has been found that by adding sufficient organic acid or salt of organic acid, along with a suitable base, to the acid copolymer or ionomer, however, the ionomer can be neutralized, without losing processability, to a level much greater than for a metal cation, hence the term HNP. Preferably, the acid moieties are neutralized greater than about 80%, preferably from 90-100%, most preferably 100% without losing processability. This is accomplished by melt-blending an ethylene α,β-ethylenically unsaturated carboxylic acid copolymer, for example, with an organic acid or a salt of organic acid, and adding a sufficient amount of a cation source to increase the level of neutralization of all the acid moieties (including those in the acid copolymer and in the organic acid) to greater than 90%, (preferably greater than 100%). Other layers of a dual core, preferably the outer core layer, may be formed from a rubber-based composition treated to define a steep “positive” hardness gradient, and preferably the inner core layer is formed from the thermoplastic material of the invention and has a “positive hardness gradient” that is ‘shallow’ relative to the gradient of the outer core layer. For example, the inner core may be formed from the ‘hardness gradient’ thermoplastic material of the invention to form the shallow “positive hardness gradient” and the outer core layer may include the thermosetting rubber composition having a ‘steep’ “positive hardness gradient.” The terms ‘steep’ and ‘shallow’ refer to the magnitude of the slope of the hardness gradients of the respective layers—as long as the slope of the hardness gradient of the outer core layer is greater than that of the inner core layer, it will be termed ‘steep’ (and the inner core layer deemed ‘shallow’). Modifications in thermoplastic polymeric structure to create the ‘shallow’ “positive hardness gradient” can be induced by a number of methods, including exposing the TP material to high-energy radiation or through a chemical process using peroxide. Radiative sources include, but are not limited to, gamma rays, electrons, neutrons, protons, x-rays, helium nuclei, or the like. Gamma radiation, typically using radioactive cobalt atoms, is a preferred method for the inventive TP gradient cores because this type of radiation allows for considerable depth of treatment, if necessary. For cores requiring lower depth of penetration, such as when a small gradient is desired or one focused near the core surface, electron-beam accelerators or UV and IR light sources can be used. Useful UV and IR irradiation methods are disclosed in U.S. Pat. Nos. 6,855,070 and 7,198,576, which are incorporated herein by reference thereto. The cores of the invention are typically irradiated at dosages greater than 0.05 Mrd, preferably ranging from 1 Mrd to 20 Mrd, more preferably from 2 Mrd to 15 Mrd, and most preferably from 4 Mrd to 10 Mrd. In one preferred embodiment, the cores are irradiated at a dosage from 5 Mrd to 8 Mrd and in another preferred embodiment, the cores are irradiated with a dosage from 0.05 Mrd to 3 Mrd, more preferably 0.05 Mrd to 1.5 Mrd. The inventive cores (or core layers) may be chemically treated in a solution, such as a solution containing one or more isocyanates, to form the desired “positive hardness gradient.” The cores are typically exposed to the solution containing the isocyanate by immersing them in a bath at a particular temperature for a given time. Exposure time should be greater than 1 minute, preferably from 1 minute to 120 minutes, more preferably 5 minutes to 90 minutes, and most preferably 10 minutes to 60 minutes. In one preferred embodiment, the cores are immersed in the treating solution from 15 minutes to 45 minutes, more preferably from 20 minutes to 40 minutes, and most preferably from 25 minutes to 30 minutes. Other suitable silanes include, but are not limited to, silane esters, such as octyltriethoxysilane, methyltriethoxylsilane, methyltrimethoxysilane, and proprietary nonionic silane dispersing agent; vinyl silanes, such as proprietary, vinyltriethoxysilane, vinyltrimethoxysilane, vinyl-tris-(2-methoxyethoxy)silane, vinylmethyldimethoxysilane; methacryloxy silanes, such as γ-methacryloxypropyltrimethoxysilane; epoxy silanes, such as β-(3,4-epoxycyclohexyl)ethyltrimethoxysilane, γ-glycidoxypropyltrimethoxysilane; sulfur silanes, such as gamma-mercaptopropyltrimethoxysilane proprietary polysulfidesilane, bis-(3-[triethoxisily]-propyl)-tetrasulfane; amino silanes, such as γ-aminopropyltriethoxysilane, γ-aminopropyltriethoxysilane, γ-aminopropyltriethoxysilane, aminoalkyl silicone solution, modified aminoorganosilane, gamma-aminopropyltrimethoxysilane, n-β-(aminoethyl)-γ-aminopropyltrimethoxysilane, modified aminoorganosilane (40% in methanol), modified aminosilane (50% in methanol), triaminofunctional silane, bis-(γ-trimethoxysilylpropyl)amine, n-phenyl-γ-aminopropyltrimethoxysilane, organomodified polydimethylsiloxane, polyazamide silane (50% in methanol), n-β-(aminoethyl)-γ-aminopropylmethyldimethoxysilane; ureido silanes, such as gamma-ureidopropyltrialkoxysilane (50% in methanol), γ-ureidopropyltrimethoxysilane; isocyanate silanes, such as γ-isocyanatopropyltriethoxysilane; and mixtures thereof. 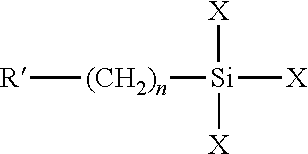 Preferably, the silane is an amino silane and more preferably, the amino silane is bis-(γ-trimethoxysilylpropyl) amine. Additional embodiments involve the use of plasticizers to treat the molded core/layer thereby creating a softer outer portion of the core for a “negative” hardness gradient. The plasticizer may be reactive (such as higher alkyl acrylates) or non-reactive (i.e., phthalates, dioctylphthalate, or stearamides, etc). Other suitable plasticizers include, but are not limited to, oxa acids, fatty amines, fatty amides, fatty acid esters, phthalates, adipates, and sebacates. Oxa acids are preferred plasticizers, more preferably those having at least one or two acid functional groups and a variety of different chain lengths. Preferred oxa acids include 3,6-dioxaheptanoic acid, 3,6,9-trioxadecanoic acid, diglycolic acid, 3,6,9-trioxaundecanoic acid, polyglycol diacid, and 3,6-dioxaoctanedioic acid, such as those commercially available from Archimica of Wilmington, Del. Any means of chemical degradation will also result in a “negative” hardness gradient. Chemical modifications such as esterification or saponification are also suitable for modification of the thermoplastic core/layer surface and can result in the desired ‘shallow’ “positive hardness gradient.” Fillers may also be added to the thermoplastic materials of the core to adjust the density of the material up or down. The ‘steep’ “negative” or, preferably, “positive hardness gradient” outer core layer(s) are formed from a composition including at least one base rubber, such as a polybutadiene rubber, cured with at least one peroxide and at least one reactive co-agent, which can be a metal salt of an unsaturated carboxylic acid, such as acrylic acid or methacrylic acid, a non-metallic coagent, or mixtures thereof. For the “negative” hardness gradient embodiments, a suitable antioxidant can be included in the core layer composition. An optional ‘soft and fast agent’ (and sometimes a cis-to-trans catalyst), such as an organosulfur or metal-containing organosulfur compound, can also be included in the core layer formulation. To form the steep “positive hardness gradient” across the outer core layers of the invention, a gradient-promoting additive (GPA) is preferably added to the outer core layer compositions. Suitable GPA's are discussed below. Examples of desirable polybutadiene rubbers include BUNA® CB 1203, CB 1220, CB1221, CB22 and CB23, commercially available from LANXESS Corporation; UBEPOL® 360L and UBEPOL® 150L and UBEPOL-BR rubbers, commercially available from UBE Industries, Ltd. of Tokyo, Japan; Europrene® NEOCIS® BR 40 and BR 60, commercially available from Polimeri Europa; and BR 01, BR 730, BR 735, BR 11, and BR 51, commercially available from Japan Synthetic Rubber Co., Ltd; BUNA® CB Nd40 from Lanxess; and KARBOCHEM® ND40, ND45, and ND60, commercially available from Karbochem. Commercial sources of suitable mid- to high-Mooney viscosity polybutadiene include BUNA® CB23 (Nd-catalyzed), which has a Mooney viscosity of around 50 and is a highly linear polybutadiene, and BUNA® CB1220 (Co-catalyzed). If desired, the polybutadiene can also be mixed with other elastomers known in the art, such as other polybutadiene rubbers, natural rubber, styrene butadiene rubber, and/or isoprene rubber in order to further modify the properties of the core. When a mixture of elastomers is used, the amounts of other constituents in the core composition are typically based on 100 parts by weight of the total elastomer mixture. In one preferred embodiment, the base rubber comprises a Nd-catalyzed polybutadiene, a transition metal polybutadiene rubber, or blends thereof. If desired, the polybutadiene can also be mixed with other elastomers known in the art such as natural rubber, polyisoprene rubber and/or styrene-butadiene rubber in order to modify the properties of the core. Other suitable base rubbers include thermosetting materials such as, ethylene propylene diene monomer rubber, ethylene propylene rubber, butyl rubber, halobutyl rubber, hydrogenated nitrile butadiene rubber, nitrile rubber, and silicone rubber. Thermoplastic elastomers (TPE) many also be used to modify the properties of the core layers, or the uncured core layer stock by blending with the base rubber. These TPEs include styrenic block copolymers, such as styrene ethylene butadiene styrene, styrene-isoprene-styrene, etc., a metallocene or other single-site catalyzed polyolefin such as ethylene-octene, or ethylene-butene, or thermoplastic polyurethanes (TPU), including copolymers, e.g. with silicone. Other suitable TPEs for blending with the thermoset rubbers of the present invention include PEBAX®, which is believed to comprise polyether amide copolymers, HYTREL®, which is believed to comprise polyether ester copolymers, thermoplastic urethane, and KRATON®, which is believed to comprise styrenic block copolymers elastomers. Any of the TPEs or TPUs above may also contain functionality suitable for grafting, including maleic acid or maleic anhydride. 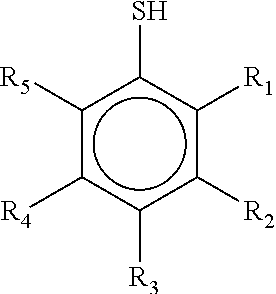 Suitable peroxide initiating agents include dicumyl peroxide; 2,5-dimethyl-2,5-di(t-butylperoxy)hexane; 2,5-dimethyl-2,5-di(t-butylperoxy)hexyne; 2,5-dimethyl-2,5-di(benzoylperoxy)hexane; 2,2′-bis(t-butylperoxy)-di-iso-propylbenzene; 1,1-bis(t-butylperoxy)-3,3,5-trimethyl cyclohexane; n-butyl 4,4-bis(t-butyl-peroxy)valerate; t-butyl perbenzoate; benzoyl peroxide; n-butyl 4,4′-bis(butylperoxy)valerate; di-t-butyl peroxide; or 2,5-di-(t-butylperoxy)-2,5-dimethyl hexane, lauryl peroxide, t-butyl hydroperoxide, α-α bis(t-butylperoxy)diisopropylbenzene, di(2-t-butyl-peroxyisopropyl)benzene, di-t-amyl peroxide, di-t-butyl peroxide. Preferably, the rubber composition includes from about 0.25 to about 5.0 parts by weight peroxide per 100 parts by weight rubber (phr), more preferably 0.5 phr to 3 phr, most preferably 0.5 phr to 1.5 phr. In a most preferred embodiment, the peroxide is present in an amount of about 0.8 phr. These ranges of peroxide are given assuming the peroxide is 100% active, without accounting for any carrier that might be present. Because many commercially available peroxides are sold along with a carrier compound, the actual amount of active peroxide present must be calculated. Commercially-available peroxide initiating agents include DICUP™ family of dicumyl peroxides (including DICUP® R, DICUP® 40C and DICUP® 40KE) available from Crompton (Geo Specialty Chemicals). Similar initiating agents are available from AkroChem, Lanxess, Flexsys/Harwick and R.T. Vanderbilt. Another commercially-available and preferred initiating agent is TRIGONOX® 265-50B from Akzo Nobel, which is a mixture of 1,1-di(t-butylperoxy)-3,3,5-trimethylcyclohexane and di(2-t-butylperoxyisopropyl)benzene. TRIGONOX® peroxides are generally sold on a carrier compound. Preferably, about 0.25 phr to about 1.5 phr of peroxide as calculated at 100% active can be added to the core formulation, more preferably about 0.5 phr to about 1.2 phr, and most preferably about 0.7 phr to about 1.0 phr. The ZDA amount can be varied to suit the desired compression, spin and feel of the resulting golf ball. The cure regime can have a temperature range between from about 290° F. to about 335° F., more preferably about 300° F. to about 325° F., and the stock is held at that temperature for at least about 10 minutes to about 30 minutes. To form the steep “positive” hardness gradient across the outer core layer of the present invention, it is preferred that a gradient-promoting additive (GPA) is present. Suitable GPA's include, but are not limited to benzoquinones, resorcinols, catechols, quinhydrones, and hydroquinones. Those, and other methods and material for creating a steep “positive” hardness gradient are disclosed in U.S. patent application Ser. Nos. 12/168,979; 12/168,987; 12/168,995; and 12/169,002, which are incorporated herein by reference thereto. The thermoset rubber composition of the present invention may also include an optional soft and fast agent. As used herein, “soft and fast agent” means any compound or a blend thereof that that is capable of making a core 1) softer (lower compression) at constant COR or 2) have a higher COR at equal compression, or any combination thereof, when compared to a core equivalently prepared without a soft and fast agent. Preferably, the composition of the present invention contains from about 0.05 phr to about 10.0 phr soft and fast agent. In one embodiment, the soft and fast agent is present in an amount of about 0.05 phr to about 3.0 phr, preferably about 0.05 phr to about 2.0 phr, more preferably about 0.05 phr to about 1.0 phr. In another embodiment, the soft and fast agent is present in an amount of about 2.0 phr to about 5.0 phr, preferably about 2.35 phr to about 4.0 phr, and more preferably about 2.35 phr to about 3.0 phr. In an alternative high concentration embodiment, the soft and fast agent is present in an amount of about 5.0 phr to about 10.0 phr, more preferably about 6.0 phr to about 9.0 phr, most preferably about 7.0 phr to about 8.0 phr. In a most preferred embodiment, the soft and fast agent is present in an amount of about 2.6 phr. where R1-R5 can be C1-C8 alkyl groups; halogen groups; thiol groups (—SH), carboxylated groups; sulfonated groups; and hydrogen; in any order; and also pentafluorothiophenol; 2-fluorothiophenol; 3-fluorothiophenol; 4-fluorothiophenol; 2,3-fluorothiophenol; 2,4-fluorothiophenol; 3,4-fluorothiophenol; 3,5-fluorothiophenol 2,3,4-fluorothiophenol; 3,4,5-fluorothiophenol; 2,3,4,5-tetrafluorothiophenol; 2,3,5,6-tetrafluorothiophenol; 4-chlorotetrafluorothiophenol; pentachlorothiophenol; 2-chlorothiophenol; 3-chlorothiophenol; 4-chlorothiophenol; 2,3-chlorothiophenol; 2,4-chlorothiophenol; 3,4-chlorothiophenol; 3,5-chlorothiophenol; 2,3,4-chlorothiophenol; 3,4,5-chlorothiophenol; 2,3,4,5-tetrachlorothiophenol; 2,3,5,6-tetrachlorothiophenol; pentabromothiophenol; 2-bromothiophenol; 3-bromothiophenol; 4-bromothiophenol; 2,3-bromothiophenol; 2,4-bromothiophenol; 3,4-bromothiophenol; 3,5-bromothiophenol; 2,3,4-bromothiophenol; 3,4,5-bromothiophenol; 2,3,4,5-tetrabromothiophenol; 2,3,5,6-tetrabromothiophenol; pentaiodothiophenol; 2-iodothiophenol; 3-iodothiophenol; 4-iodothiophenol; 2,3-iodothiophenol; 2,4-iodothiophenol; 3,4-iodothiophenol; 3,5-iodothiophenol; 2,3,4-iodothiophenol; 3,4,5-iodothiophenol; 2,3,4,5-tetraiodothiophenol; 2,3,5,6-tetraiodothiophenoland; and their zinc salts. Preferably, the halogenated thiophenol compound is pentachlorothiophenol, which is commercially available in neat form or under the tradename STRUKTOL®, a clay-based carrier containing the sulfur compound pentachlorothiophenol loaded at 45 percent (correlating to 2.4 parts PCTP). STRUKTOL® is commercially available from Struktol Company of America of Stow, Ohio. PCTP is commercially available in neat form from eChinachem of San Francisco, Calif. and in the salt form, also from eChinachem. Most preferably, the halogenated thiophenol compound is the zinc salt of pentachlorothiophenol, which is commercially available from eChinachem. Referring to FIG. 1, the center (mid-point) of the thermoplastic inner core layer should have a hardness of at least about 90 Shore C, preferably from about 90 Shore C to about 100 Shore C, more preferably from about 92 Shore C to about 98 Shore C, and most preferably from about 94 Shore C to about 96 Shore C. The outer surface of the inner core layer has a hardness that is greater than the hardness of the center of the inner core layer (to define the “negative” hardness gradient), at least about 85 Shore C, preferably from about 85 Shore C to about 95 Shore C, more preferably from about 87 Shore C to about 93 Shore C, and most preferably about 89 Shore C to about 91 Shore C.
The inner surface of the thermoset rubber outer core layer has a Shore C hardness of about 50 Shore C to about 60 Shore C, preferably about 52 Shore C to about 58 Shore C, more preferably from about 54 Shore C to about 56 Shore C. The outer surface of the outer core layer has a hardness that is substantially greater than the hardness of the inner surface of the outer core layer (to define the steep “positive” hardness gradient), at least about 82 Shore C, preferably about 82 Shore C to about 92 Shore C, more preferably about 84 Shore C to about 90 Shore C, most preferably about 86 Shore C to about 88 Shore C. The gradient should be steep—at least 25 Shore C, preferably 25 Shore C to 45 Shore C, more preferably 25 Shore C to 40 Shore C, and most preferably 30 Shore C to 35 shore C.
The difference in hardness, Δh, between the outer surface of the inner core layer and the inner surface of the outer core layer, should be at least 25 Shore C, preferably 25 Shore C to 45 Shore C, more preferably 25 Shore C to 40 Shore C, and most preferably 30 Shore C to 35 shore C (meaning that the inner surface of the outer core layer is substantially softer than the outer surface of the inner core). In one embodiment, the outer surface of the outer core layer is also softer than the outer surface of the inner core layer, preferably by 1 Shore C to 5 Shore C, more preferably by 1 Shore C to 3 Shore C, and alternatively by 3 Shore C to 5 Shore C.
As described above, the preferred embodiment is a golf ball having a dual core. The dual core includes an inner core formed from a thermoplastic material and the outer core layer is formed from a thermoset material. The inner core material exhibits a ‘shallow’ “positive hardness gradient” across its radius. The outer core layer may exhibit a ‘steep’ “positive hardness gradient” across its thickness, the slope of the gradient being greater than that of the gradient of the inner core by a larger amount, but most preferably the outer core layer exhibits a ‘shallow’ “positive hardness gradient” across its thickness. Hardness measurements are made as described herein. The hardness measurements for the gradient of the inner core are taken across the radius of a cross-section of the inner core. The hardness measurements for the gradient of the outer core layer are taken across the thickness of a cross-section of the outer core layer. In an alternative but most preferred construction of the above embodiment, the thermoplastic inner core has an outer diameter of about 0.5 inches. The positive hardness gradient of the inner core is preferably 5 to 15 Shore C, more preferably about 8 to 12 Shore C, and most preferably about 8 to 10 Shore C. In one preferred embodiment, the inner core has a positive hardness gradient of about 8. The positive hardness gradient has a slope which is preferably greater than about 1, more preferably greater than about 1.15, and most preferably greater than about 1.2. For example, referring to top of FIG. 5, the inner core hardness gradient is about 8 (˜72 Shore C-64 Shore C) over a distance of about 6.5 mm, for a slope of about 1.2. In this preferred construction, the outer core layer is about 0.515 inches thick and has a hardness gradient of about 8 Shore C to about 12 Shore C, more preferably about 9 Shore C to about 12 Shore C. The positive hardness gradient has a slope which is preferably less than about 1, more preferably less than about 0.98, and most preferably less than about 0.96. For example, referring to top of FIG. 5, the outer core hardness gradient is about 12 (˜84 Shore C-72 Shore C) over a distance of about 12.5 mm, for a slope of about 0.96. The ratio of the slope of the hardness gradient of the outer core to the slope of the hardness gradient of the inner core is preferably from 0.8 to 0.85, and more preferably 0.8 to 0.82. In an alternative but preferred construction of the above embodiment, the thermoplastic inner core has an outer diameter of about 1.0 inch. The positive hardness gradient of the inner core is preferably 10 to 16 Shore C, more preferably about 11 to 15 Shore C, and most preferably about 12 to 15 Shore C. In one preferred embodiment, the inner core has a positive hardness gradient of about 15. The positive hardness gradient has a slope which is preferably greater than about 1, more preferably greater than about 1.15, and most preferably greater than about 1.2. For example, referring to top of FIG. 6, the inner core hardness gradient is about 15 (˜79 Shore C-64 Shore C) over a distance of about 12 mm, for a slope of about 1.2. In this preferred construction, the outer core layer is about 0.275 inches thick and has a hardness gradient of about 6 Shore C to about 12 Shore C, more preferably about 8 Shore C to about 10 Shore C. The positive hardness gradient has a slope which is preferably less than about 1, more preferably less than about 0.98, and most preferably less than about 0.96. For example, referring to top of FIG. 6, the outer core hardness gradient is about 8 (˜87 Shore C-79 Shore C) over a distance of about 8.1 mm, for a slope of about 0.98. The ratio of the slope of the hardness gradient of the outer core to the slope of the hardness gradient of the inner core is preferably from 0.8 to 0.85, and more preferably 0.8 to 0.82.
wherein the first and second hardness gradients each have a slope and the slope of the second hardness gradient is less than the slope of the first hardness gradient such that a ratio of the first and second slopes is 0.8 to 0.85. 2. The golf ball of claim 1, wherein the ratio of the first and second slopes is 0.8 to 0.83. 3. The golf ball of claim 2, wherein the ratio of the first and second slopes is 0.81 to 0.82. 4. The golf ball of claim 1, wherein the slope of the first hardness gradient is greater than about 1 and the slope of the second hardness ratio is less than about 1. 5. The golf ball of claim 4, wherein the slope of the first hardness gradient is greater than about 1.15 and the slope of the second hardness ratio is less than about 0.98. 6. The golf ball of claim 1, wherein the inner core layer has an outer diameter of about 0.5 inches to about 1.13 inches. 7. The golf ball of claim 1, wherein the acid groups of the copolymer are neutralized by 90% or greater. 8. The golf ball of claim 7, wherein the acid groups of the copolymer are neutralized by about 100%. 9. The golf ball of claim 1, wherein the organic acid or salt thereof comprises barium, lithium, sodium, zinc, bismuth, chromium, cobalt, copper, potassium, strontium, titanium, tungsten, magnesium, cesium, iron, nickel, silver, aluminum, tin, or calcium salts, or salts of fatty acids. 10. The golf ball of claim 9, wherein the fatty acid salt comprises stearic acid, behenic acid, erucic acid, oleic acid, linoelic acid or dimerized derivatives thereof. 11. The golf ball of claim 9, wherein the organic acid or salt thereof comprises a magnesium salt of oleic acid. 12. The golf ball of claim 1, wherein the outer core layer comprises a soft and fast agent. 13. The golf ball of claim 12, wherein the soft and fast agent comprises a halogenated thiophenol. a cover layer disposed outer core layer, the cover layer comprising an inner cover layer comprising an ionomer and an outer cover layer comprising a castable polyurethane or polyurea material. 15. The golf ball of claim 14, wherein a ratio of the second positive hardness gradient to the first positive hardness gradient is about 0.8 to 0.85.